This trim little church conceals an extraordinary surprise. A clue is in the picture above - tucked away behind the rebuilt 19th century flintwork you can see a red-brick extension, stuck on the north side of the chancel and hiding a view of the tower from the east. For one moment you might even think it was the Rector's garage. This Denham is not to be confused with Denham St John, thirty miles away to the east. Here, we are in another tiny village, but close to the large village of Barrow, beyond the park of Denham Hall, where at the time of my first visit deer and wild boar were farmed for the gourmet market. Coming back in 2011, I didn't see anything so exotic. The stables and farm buildings behind the church have all been modernised and converted into fine houses, and a high hedge conceals the graveyard from the road - indeed, if you are not using an OS map, you may miss this church completely, especially if you are in a car. On my first visit, I had to have two sweeps past on my bike. The graveyard is as neat and trim as the heavily restored church, and genealogists will be disappointed to learn that most of the old headstones have been removed. However, it is all obviously very well cared for, and loved. The interior is clean, rather dark and thoroughly Victorianised. The font and furnishings are plain. 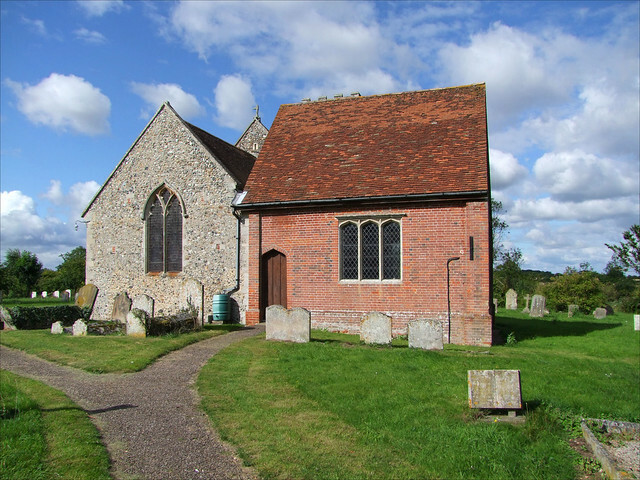 I hope I will be forgiven for saying that the nave is probably of less interest than that of almost any other medieval Suffolk church, although the sanctuary is undoubtedly attractive. If you do not know this church, you may wonder why I had been looking forward to revisiting it with some excitement. On the occasion of my first visit, back in the 1990s, I had not read in advance about this church. I knew the west of the county less well than the east, and in any case enjoyed in those days visiting a church unencumbered by other people's opinions. After a wander around, I could get Mortlock out of my rucksack, settle down in a pew and have a read. Imagine my surprise, then, on wandering down towards the holy end, and turning into another room off of the chancel. I was confronted by one of the most extraordinary monuments I have ever seen. It stands fully tweve feet high, against the north wall of the chapel (for that is what this building is). The eight figures on it, not far short of life-size, are Sir Edward and Lady Susan Lewkenor, who died of Smallpox in 1605, and their six children arrayed behind them. But they are dressed very much in the fashion of the previous century. I was put in mind of Dame Margarett Tylney, who is sleeping through all eternity across the county at Shelley. But while Dame Margaret lies in quiet piety, these figures are somewhat more animated - one might even describe them as looking like cartoon characters, their faces are such primitive caricatures of human features. Indeed, I would go as far as to say that they don't really look human. Their eyes are too close to the top of their heads, for one thing. It is as if some local amateur put in a speculatively high tender for the work, and was surprised to get the job. The boys look rather startled, as well they might, but the girls look very serious, in their ruffs and bonnets. They appear to be shuffling on their knees into heaven. The son of one of the two boys lies across the chapel on his own monument. He is a later Sir Edward, and he died in 1635. I assume that he had something to do with this chapel being built, and with the shoddy workmanship of his grandparents' tomb. Whether or not that is the case, no expense was spared for his own memorial; it is the work of John and Matthias Christmas, favourites of Charles I and carvers to the Royal Navy; Johan Matth. Christmas Fratres Fecerunt 1638, reads the subscription ('John and Matthias, the Christmas Brothers, made this, 1638'). Hand on heart, he lies peacefully in his armour, while two cherubs gaze on. This second Sir Edward Lewkenor was the last of his line; the Lewkenors of Denham Hall were not embroiled in the bloody civil war which was already brewing on the western horizon, but their house and park have survived, as we have seen. The juxtaposition between the chapel and the chancel is not unlike that at Boxted, not far off, although of course there is no aisle here. When Arthur Mee came this way in the 1930s, he found the chapel screened by iron railings, which may have been original. Whatever, they are gone today, and there is no trace of them. I wondered if they may have been surrendered to the national interest during World War II. Now, the chapel serves a dual role, for it is also the church vestry. Back outside, I wandered around for a while. The redbrick stables which form a boundary to the western side of the churchyard are very attractive. Around the corner of the church in the south side of the churchyard, tucked away behind the chapel, there are some interesting modern headstones to members of the Byford family. One to Nicholas Byford remembers that he was a civil engineer on the London Underground. The traditional vines entwine themselves around train tracks, and a London Underground train emerges from behind the foliage.